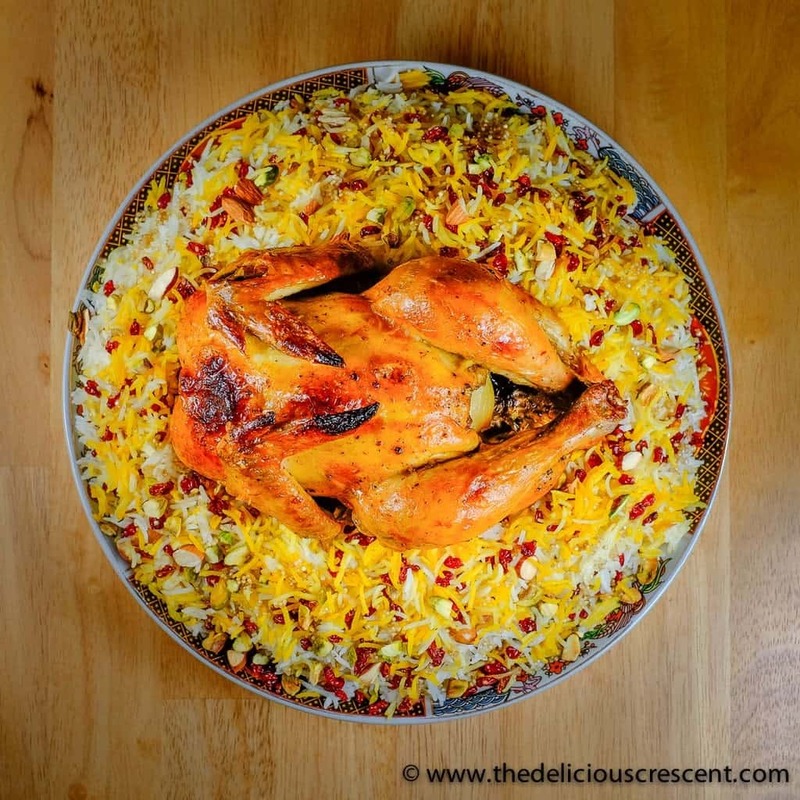 This Zereshk Polo recipe is an adapted version of the classic Persian rice dish. It is a tangy sweet mouth watering feast with plenty of protein, healthy fats and is phytochemical rich!! It is also gluten free. Cook this Barberry Rice with Saffron Chicken and add a touch of delicious opulence to the table at any banquet! WHAT IS ZERESHK POLO OR POLOW? 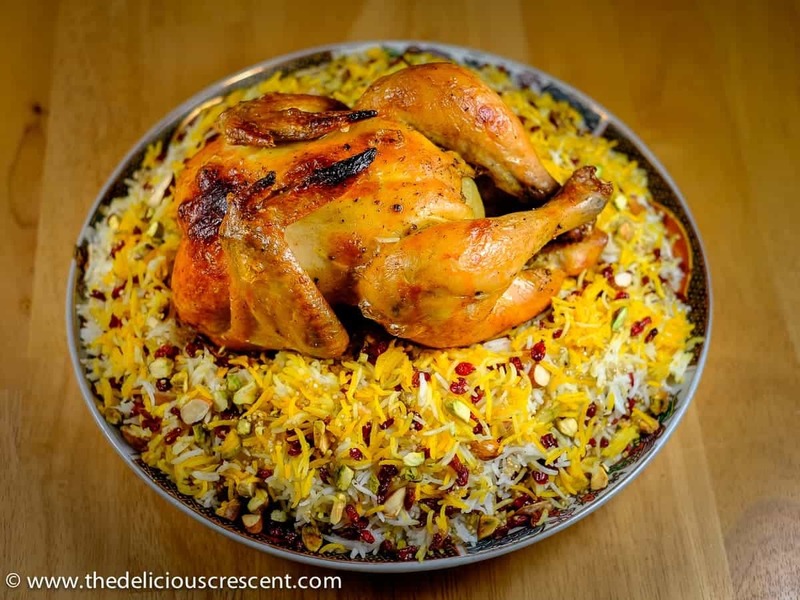 It is a flavorful Persian rice dish, studded with the super tasty barberries, almonds and pistachios, along with a nicely roasted flavorful chicken – a feast fit for a King!! The tiny jewel like barberries are know as Zereshk in Persian. And “polo” is a word used in Persian for rice preparations mixed with other ingredients. Zereshk polo is actually a pretty simple idea that is quick to prepare. And is a festive dish that is perfect for holidays and parties. At such occasions I add or alternate other popular classic Persian recipes to the menu – Ash-e Reshteh (Persian noodle soup), Ghormeh Sabzi (Persian herb stew), Persian cream of barley soup (Soup-e Jo). 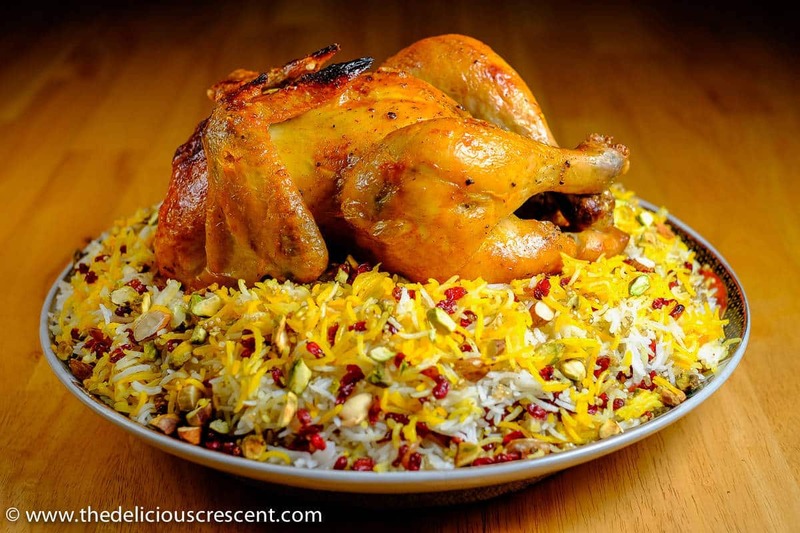 This barberry rice with saffron chicken provides an ample amount of protein from the chicken. I have altered the classic version of this rice dish by incorporating some quinoa for a variation – in taste, texture and also to enrich its nutrition value. If you love quinoa, go ahead and experiment with greater levels of substitution and share with me what you think. Quinoa is in popular press for its nutrition value – higher in protein than other grains, a complete protein, a source of antioxidants and benefits with lowering the risk of chronic disease. It lends itself beautifully in a variety of ways, such as in this Quinoa Crusted Eggplant Chickpea Patties. Barberries are a staple in the Persian kitchen. I think that these berries have the potential to appease almost anyone. They are tangy-sweet in taste, delightful in texture and add a very festive look to any dish. Apart from their taste, these berries are phytochemical rich with many health benefits and are a favored item of research. Here is another interesting way of cooking with these berries – Almond Herb Crusted Baked Fish – in this post you can also find out more about barberries. In the recipe here, I roasted the whole chicken with its skin on. Roasting the chicken with its skin on actually results in less fat in the cooked product, provided the skin is removed before consumption. The bonus is that the chicken cooked in this manner is actually a lot more juicier and tasty. You could also use just chicken thighs or leg quarters for the recipe. Traditional Persian recipes use a little bit of sugar while preparing the barberries, to sort of complement the sour taste. In the recipe here, I have used honey, but you can totally skip that if you prefer. If you would like to make the famous Persian rice crust known as Tahdig, such as in my recipe on Tahchin-e Esfenaj (Saffron Yogurt Rice with Spinach), you may check out the recipe and follow the instructions there. There are more cooking tips in the notes section below. Combine 1 teaspoon advieh spice blend, 3/4 teaspoon salt and 1/2 teaspoon black pepper. Rub this mixture all over and inside the chicken. Inserting fingers loosen the skin from the meat and rub the mixture onto the flesh and under the skin. Place a few garlic slices under the skin as well. Refrigerate the chicken for at least 4 hours or overnight. Stuff the chicken cavity with bay leaves, remaining garlic slices and whole onion. Sprinkle 1 tablespoon of saffron inside the cavity and over the chicken. Tie the ends of the legs with a cord or use a bamboo skewer to hold it in place. Place the chicken breast side up in an oven proof baking dish, cover and bake at 350º F for about 1 hour 15 minutes. Carefully transfer the chicken to a parchment paper lined baking sheet. Brush 1/2 tablespoon saffron water over the chicken and broil both sides till golden brown, about 3 to 5 minutes, as needed. Generously sprinkle the lemon juice all over the chicken. Bring 1 ½ cups of water to a rolling boil in a sauce pan. Add 1/4 teaspoon salt and 1/2 tablespoon olive oil. Then add 3/4 cup quinoa, stir and bring it to a boil. Lower the heat and allow it to cook until all the water is absorbed for about 20 minutes*. Bring 2 ½ cups of water to a boil in a rice cooker. Add 1/2 teaspoon salt and 2 tablespoons olive oil. Add the white basmati rice and stir. Let it cook just until all the water is absorbed*. In my rice cooker the whole process takes about 15 to 20 minutes. During the last 5 minutes sprinkle the remaining saffron water all over. You may set aside two scoops of this saffron rice to use for garnish. This is similar to how pasta is made. Be sure to not over cook the rice, just like you would keep the pasta al dente. Take 8 cups of water with 1.5 tablespoons salt in a large cooking pot. Bring it to a boil. Add the rice and let it boil at medium high to high heat for 5-6 minutes, until the rice grains are soft. Make sure to stir the rice while it is cooking. Drain the rice well in a colander and transfer to a large bowl. Sprinkle 2 ½ tablespoons heated oil evenly and all over. Gently fluff the rice making sure to not break any grains. Scatter the remaining saffron water all over. You may set aside two scoops of this saffron rice to use for garnish. While the rice is cooking, heat 1/2 tablespoon olive oil at medium setting in a cooking pot. Add the sliced onions and sauté few minutes until light golden brown. Add the cleaned barberries and stir for a minute at low heat - not more, as they burn easily. Add 1/2 teaspoon advieh spice blend and mix. Turn off the heat. Add the honey, stir and set aside. Place the rice or rice-quinoa mixture with the sautéed onion/barberry mixture in several alternating layers in a serving dish. Place the prepared chicken over the rice. Garnish the Zereshk Polo Ba Morgh with almonds, pistachios, some barberries and saffron rice. When serving, discard chicken skin and carve. Enjoy the Barberry Rice with Saffron Chicken, some yogurt, pickles and salad. If you prefer to make the rice crust such as in my recipe on Saffron Yogurt Rice with Spinach and Prunes, check the recipe and follow the instructions and use 2 tablespoons of yogurt in place of the marinade used in that recipe. 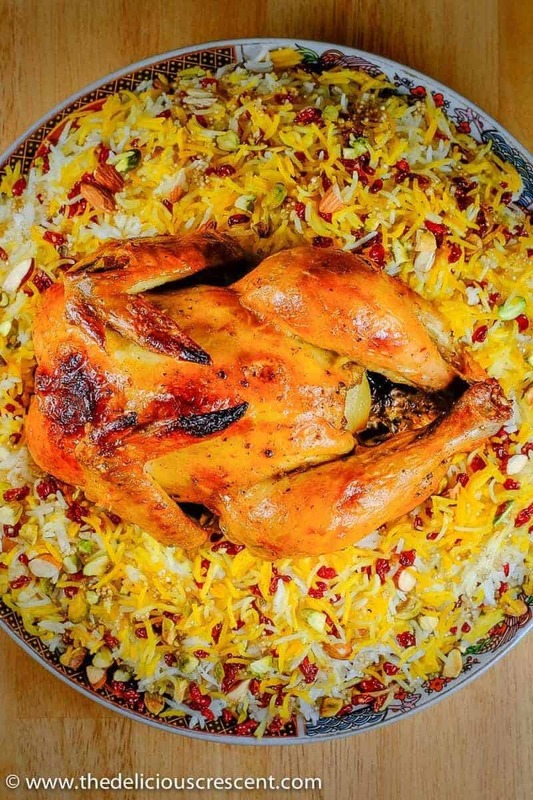 The notes section at the above recipe link has more tips for making perfect Persian rice. Dried barberries need to be cleaned well. Remove the tiny stems and place the barberries in a colander and immerse in a bowl of cold water for about 20 minutes until all the sand settles in the bottom of the bowl. Rinse the barberries thoroughly couple of times to make sure there is no sand. The rice or rice-quinoa layers may be steamed along with the onion-barberry mixture but this would result in some loss of color from the barberries and leaching on to the rice grains. For cooking quinoa, check with package instructions as well. May substitute some of the oil used for the rice with grass fed ghee or butter. May use ground cumin powder instead of advieh (Persian spice blend). These spices are available at Persian and middle eastern stores or online. Persian spice mix (Advieh) recipe is on the blog. For more tips check the blog post above. * Sodium value may vary. Check for any added salt in spice mixes and other ingredients and adjust. OH MY GOD…too, too good. And about 10 times easier than I’ve been making it for 30 years! After a year or two, and after seeing my MILs face the first time she ate my food, I knew I had to kick it up a notch…Lol!!! Thanks for all the things you do, and I now worship the ground you float upon!! Persian Recipes are ‘SIMPLY THE BEST’. Hi Faranak. I am truly delighted to read this super encouraging feedback. Thanks so much for stopping by and making my day :) Really sweet!